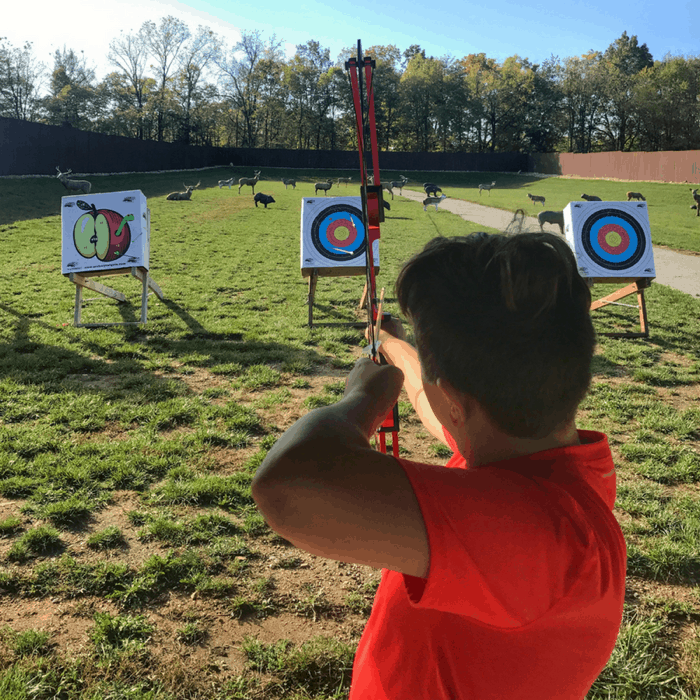 Fans of the Hunger Game series can find their inner Katniss Everdeen and sharpen their skills at the Koteewi Archery Range. As someone who lives in the suburbs, I don’t have the proper space in my backyard to create a safe zone to practice my archery skills. 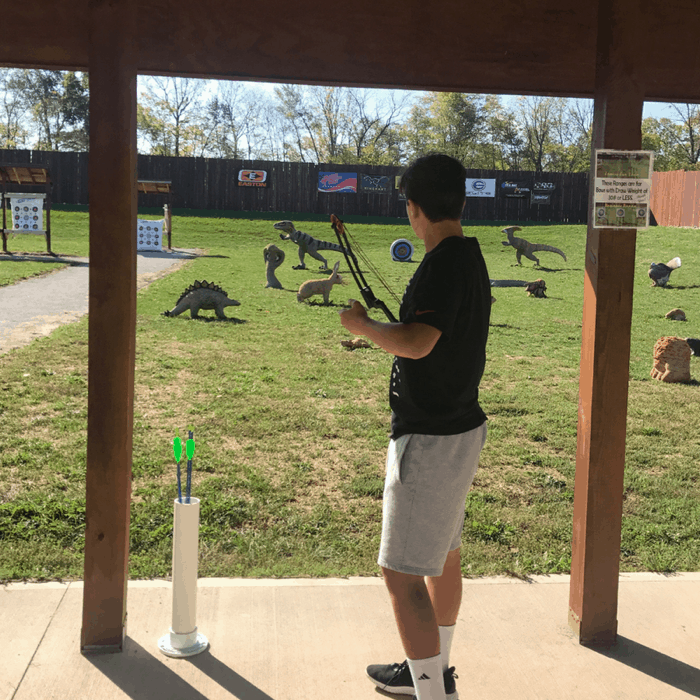 The best part about Koteewi Archery Range is that it’s set up for all skill levels with 5 courses ranging from 30 and 90 yards, and 90 meters with archer shots ranging from 5 yards to almost 100 yards. 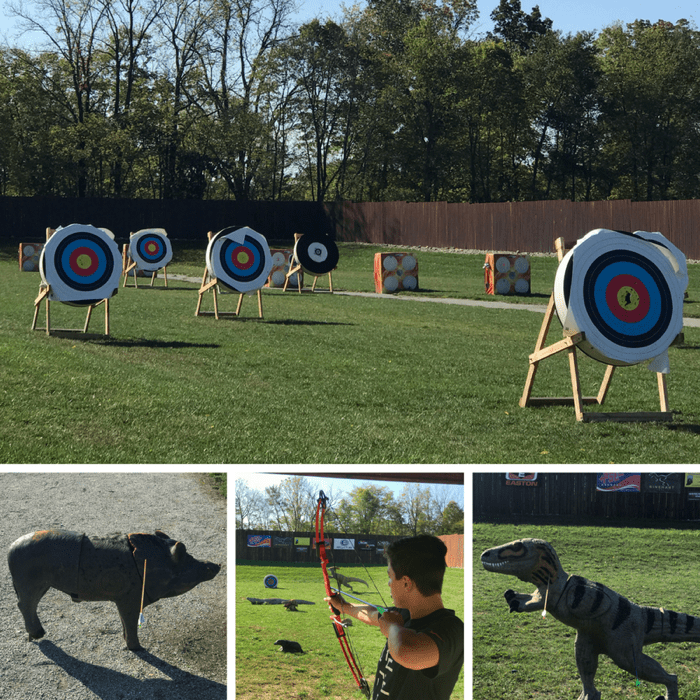 We started out with a demo from an employee where we focused on short-range traditional targets and then moved on to the 3D targets with realistic looking animals. After several rounds, we moved over to the family range that has 3D dinosaurs. We didn’t even care that our choice would typically appeal to younger ages because how often do you get to shoot at dinosaurs? The experience was really fun and very safe. I think the most challenging part was locating all of our arrows when it was time to recover them. Rental equipment is just $15 for the first hour including range time. $7 each additional hour! They have traditional recurve and longbows, as well as Genesis bows. They also have special rates that work well for a family or 4 or a date night. If you have a larger group you will want to call ahead. If you decide that you want to invest in the sport you can find everything that you need at the gift shop. This is a wonderful way to introduce your self to the sport or to sharpen your skills. The range is typically open rain or shine but you will want to double check the website before you visit because the days and hours change depending on the season. 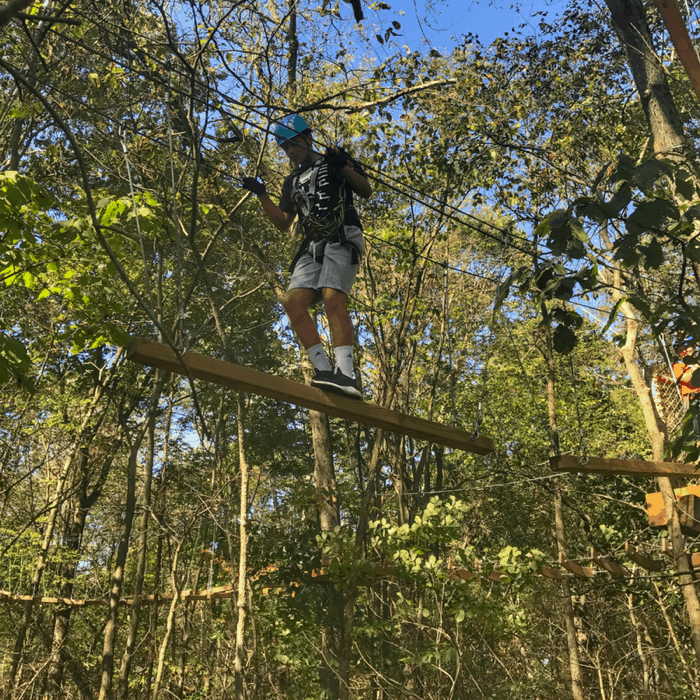 A short drive down the road from Koteewi Archery Park, another adventure awaits you at Koteewi Aerial Park featuring thrills for every skill level with 60 treetop trails and zip lines. Before you start on the course you are given a safety demonstration with staff to make sure that you know how to use your equipment properly. 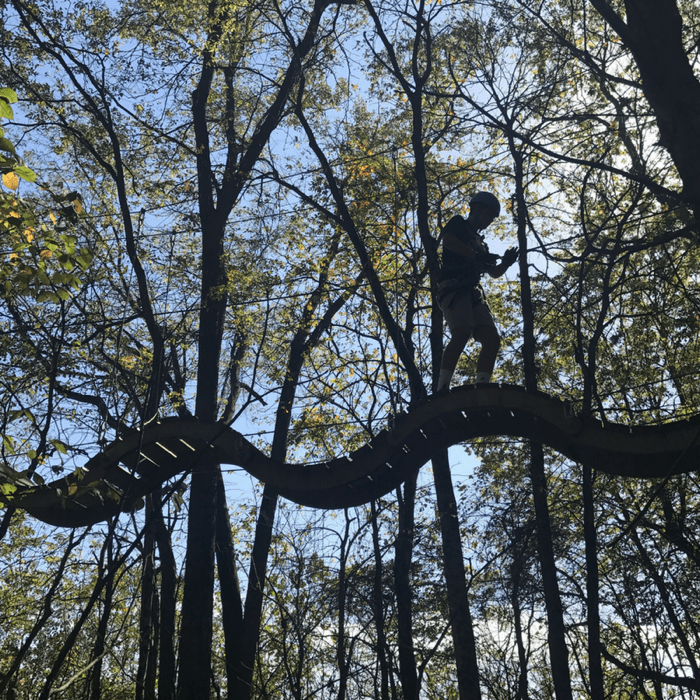 The course uses a Quik Trekker continuous belay system that keeps you connected to the safety line continuously from start to finish. This was the first time that I had used this type of system on an aerial course. Once I was used to it, I really loved it because it helps to give you freedom on the course. You can go at your own pace with your comfort level. 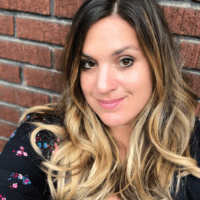 If you want to allow someone to move ahead of you on the line you also have places on the platform that allow you to do that with the system with ease. I absolutely LOVED that the courses were challenging in a good way. 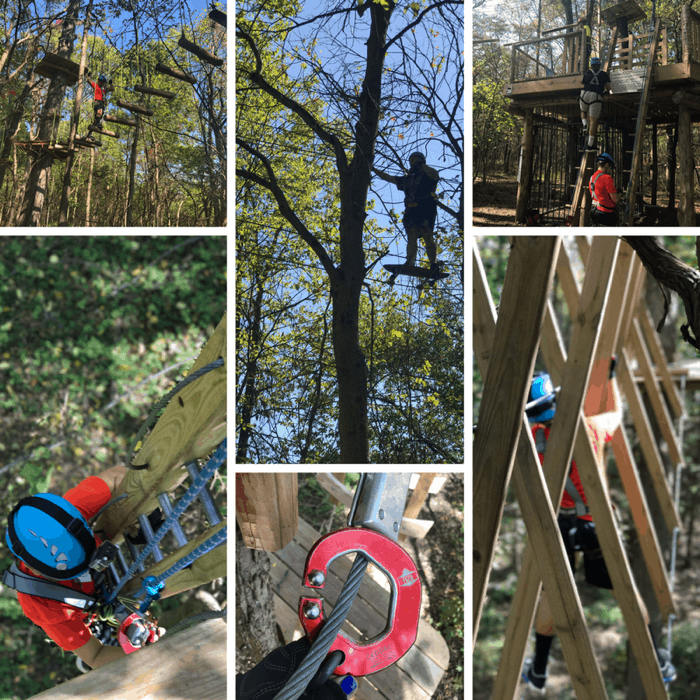 Each obstacle you face gives you an opportunity to push yourself and gain new confidence with course heights ranging from 16 ft to 60 ft in the air. All aerial park participants start on the same platform and then graduate to different levels. You need to start with a yellow or green course before you can move to the more advanced courses. The more difficult courses also have age restrictions and need to be supervised or accompanied by an adult. My younger son and I made it through all of the courses except the final level due to time which has given me another reason to want to return. Participants can choose two hours, three hours, or day-long options. My older son was able to go on the most difficult level that includes a skateboard on the line. The minimum age for the course is 8, with a minimum weight of 40lbs and hands must reach 66″ high with feet flat on the ground. 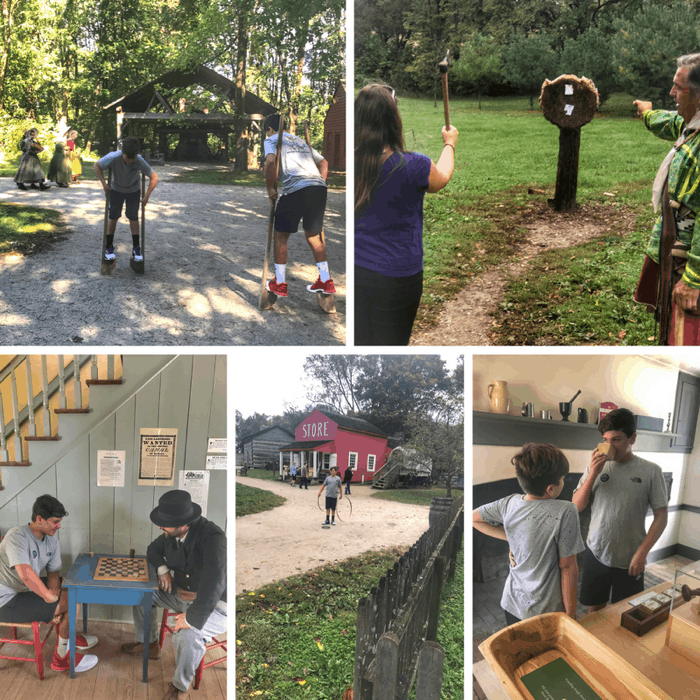 Conner Prairie in Fishers is an interactive history park that makes learning fun and interesting! 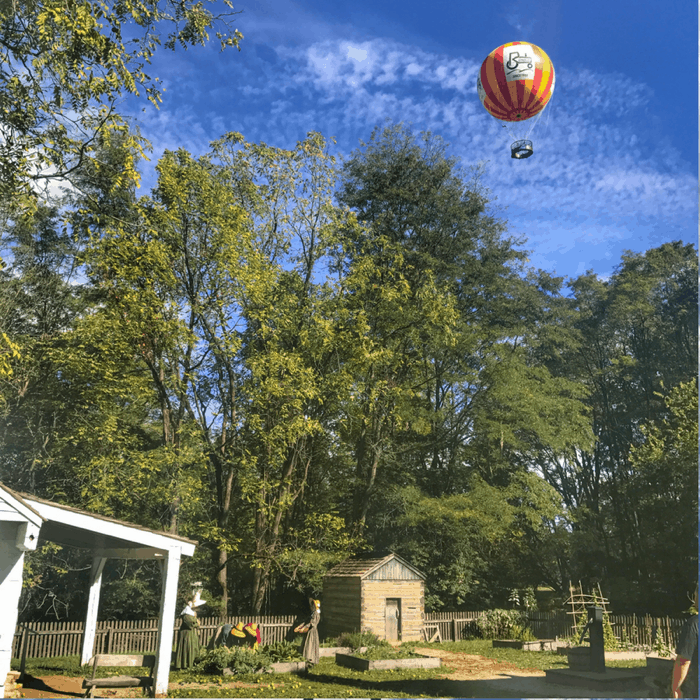 Even though the 1859 Balloon Voyage looks extreme, you will find that the tethered balloon ride is very kid friendly, smooth, and relaxing. 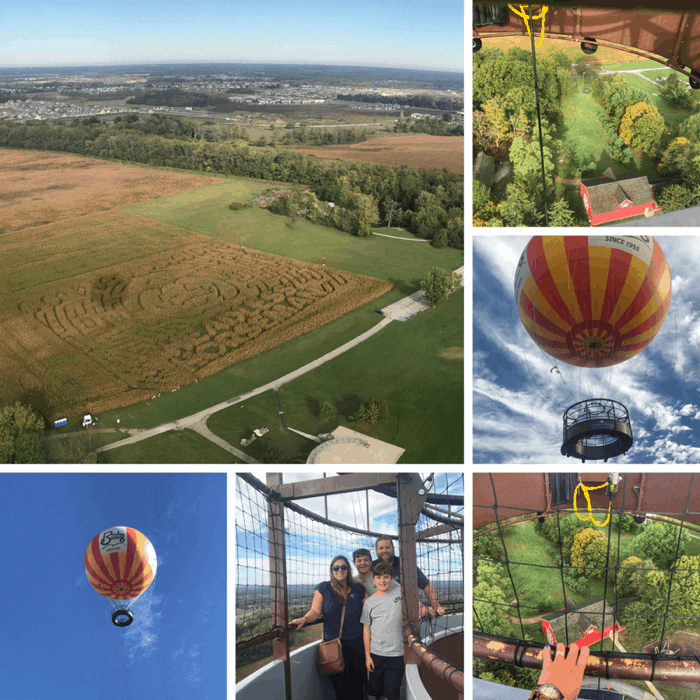 The helium balloon ride takes passengers up to a final height of 370 feet in the air providing a great aerial view of Conner Prairie and views of the Indianapolis skyline on a clear day. The average ride lasts 10-15 minutes which includes ascending and descending and can hold up to 20 people weather permitting. The balloon is controlled by trained pilots and ground crew and the balloon will not fly if weather conditions are unsafe. 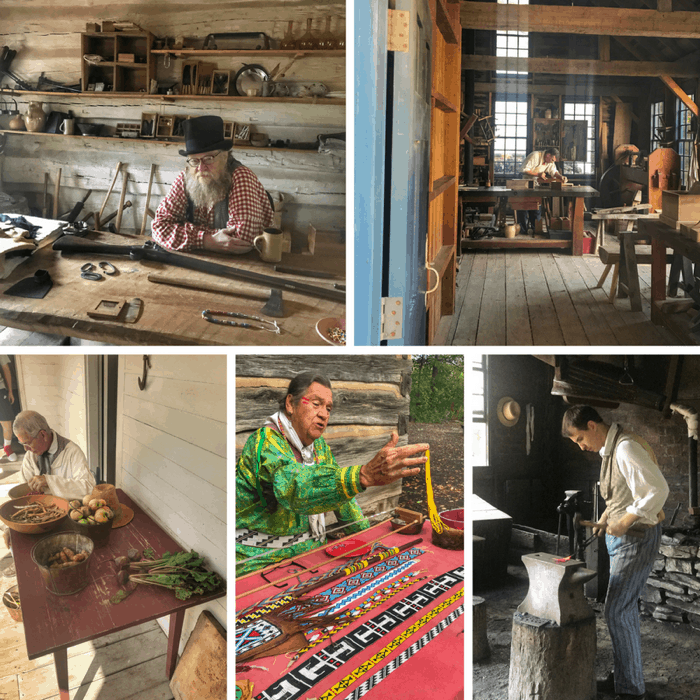 If you prefer to keep both feet on the ground you can try your hand at ax throwing, old-fashioned yard games, a stilt-walking race, or trying to defeat a historical character at a game of checkers. 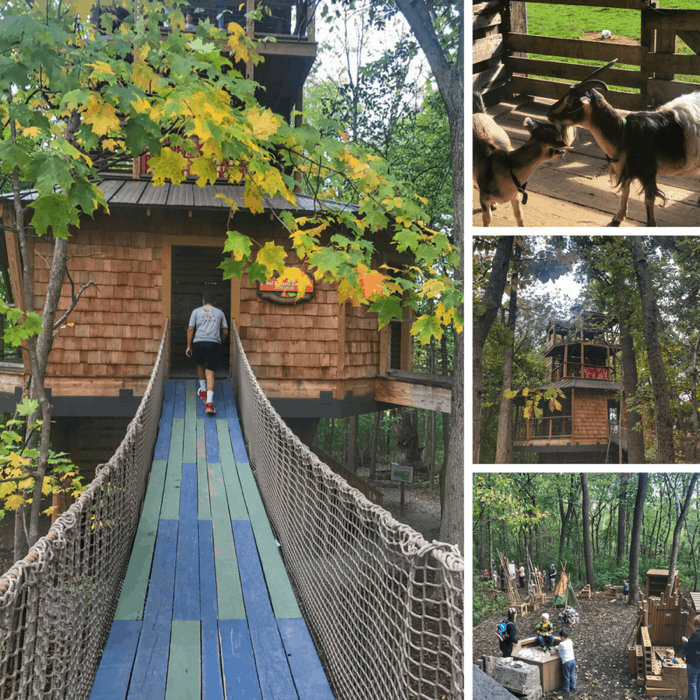 The animal barn and the treehouse are also fun stops that you don’t want to overlook with lots of interactive play features. You could also try to stump the historical actors but I’ll warn you that they are really good at staying in their character. They won’t acknowledge anything outside of their time period. Make sure that you allow several hours for your visit to Conner Prairie. There is a LOT to see both inside and out! If you get hungry there is a restaurant on site with reasonable prices. If you visit in the fall, you will also want to check out the Apple Store with lots of apple themed treats and goodies. 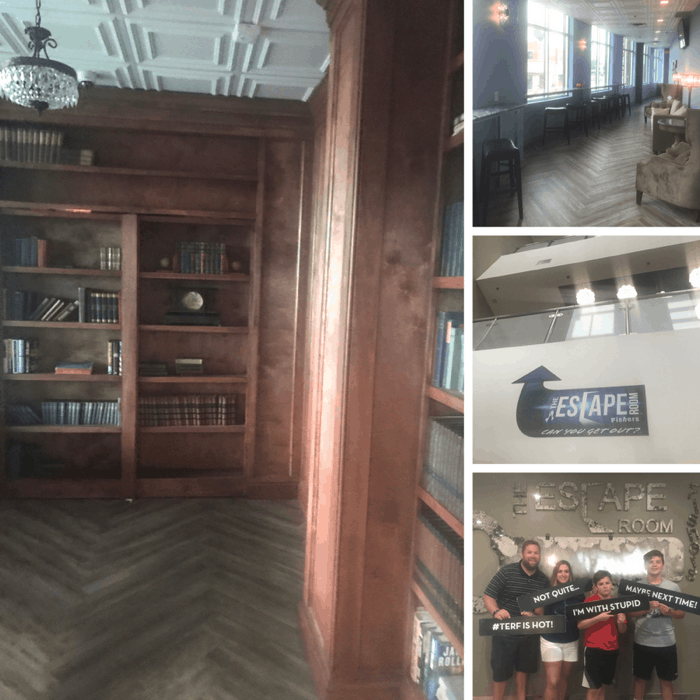 If you want to see how you do under pressure, you need to experience an escape room with your loved ones at The Escape Room Fishers. I’ve visited several escape rooms before but this one was my first with all of my family members. I’m happy to report that we didn’t kill each other and we handled the pressure relatively well. 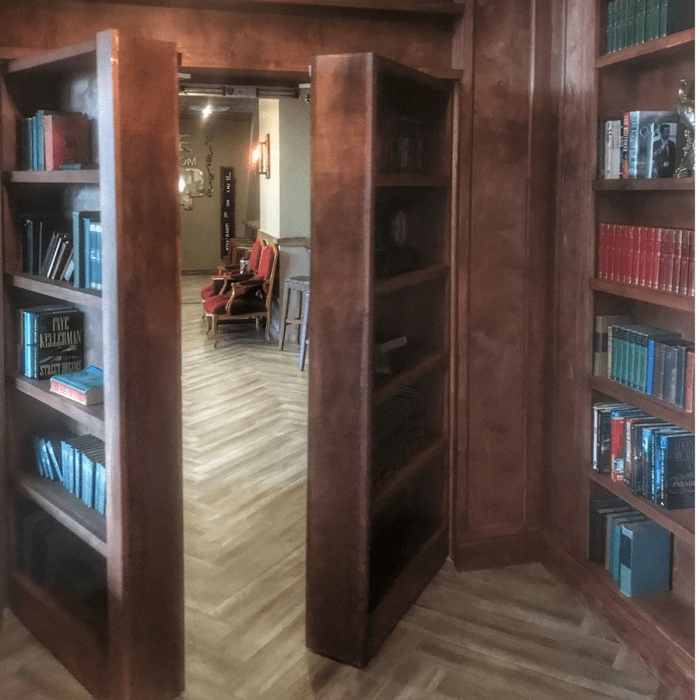 I knew that the Escape Room Fishers was going to be a good one because they were all about the details, even down to the secret entry door from the lobby that takes you to enter into the waiting area. By the way, this waiting area is the type of space that you don’t mind hanging out for a while in. You can enjoy a variety of adult beverages from wine to beer in a beautiful contemporary space that includes a Chihuly inspired chandelier and a spacious outdoor patio. I can’t give away any clues from our experience but I will tell you that the creativity and detail in our racing themed escape room were at another level in a good way. We were SOOO close but we ran out of time just as we were solving our final clues. Our theme was the introductory level with a 90% success rate which of course drives me even crazier that we didn’t make it out in time. We still had a great time and hopefully, you will do better than we did. 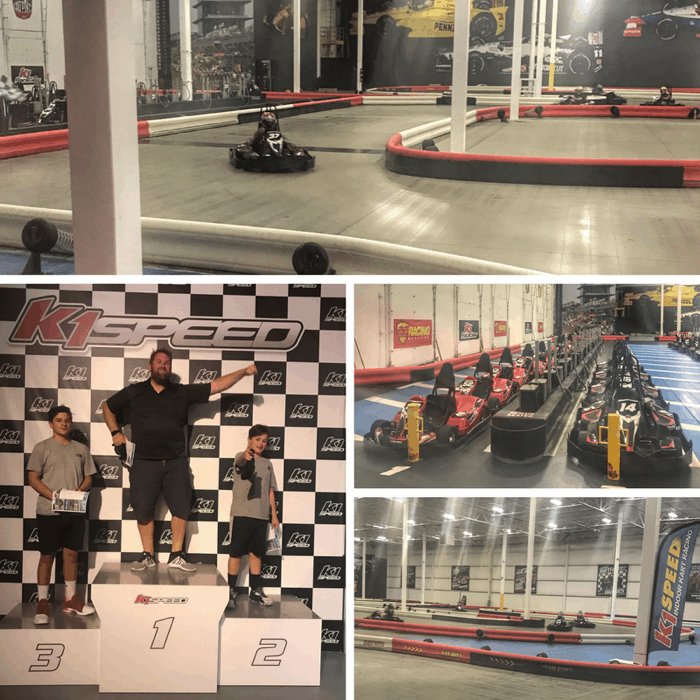 Put the pedal to the metal at K-1 Speed in Fishers. 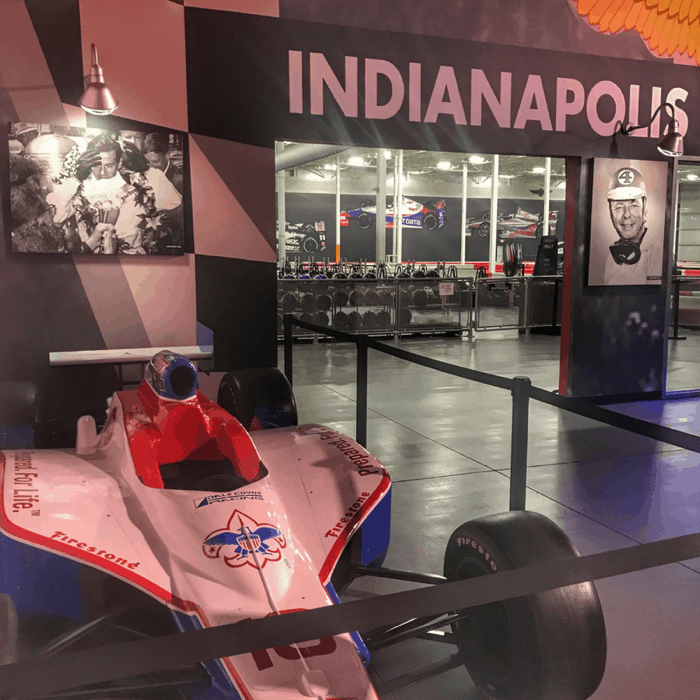 You can reach speeds up to 45 mph with the adult karts and up to 20 mph with the junior karts at this electric indoor racing track. You don’t need previous experience and you are given safety instructions, rules, flags, and signals to be aware of before your race. Each rider is also required to wear a helmet and head sock that are provided for you during your race. There is nothing that makes my boys happier than the satisfaction of lapping their mom around the track and I don’t mind giving them small victories from time to time. *All junior racers must be at least 48” and adult racers must be at least 4? 10? tall to race. All racers should be under 7ft tall and 300 lbs. Make sure that you also wear close-toed shoes. My family had such a great time in Hamilton County. These shared adventures are perfect for families, a group of friends, or a date night. Thanks again to Visit Hamilton County for hosting our visit. 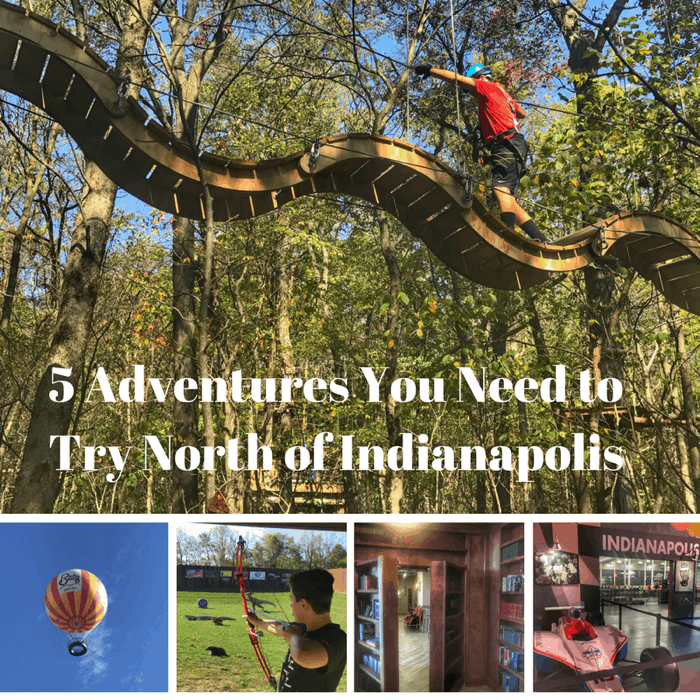 I had no idea that Indianapolis was such an adventure lover’s paradise! 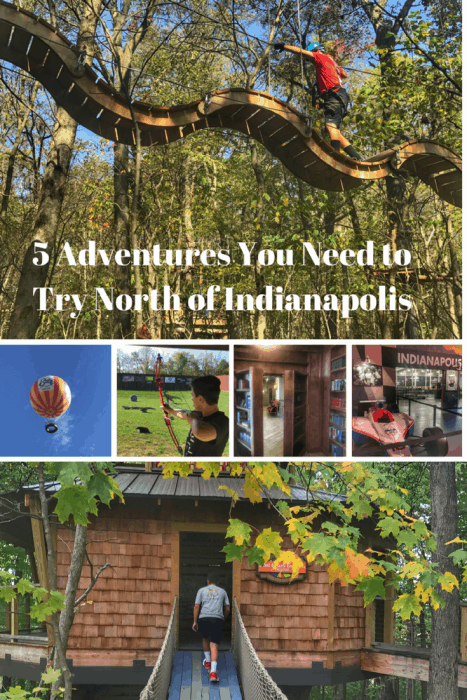 Our little ones would really enjoy a visit to Connors Prairie…I will add it to our list! Looks like fun.